As a Singaporean, we all started off flying Singapore Airlines initially and as such getting into the Krisflyer program was a natural progression as we begin to fly more and more both for leisure and for work. However, the one thing about Singapore Airlines flights is that it is so goddam expensive. Then when I started work in QQland, I ended up taking Cathay Pacific flights for my home leave back to Singapore out from Hong Kong, simply because it is cheaper and mind you, Cathay Pacific is an awesome airline too. Some may simply ask, why not budget airlines like Jetstar or Tiger which are even cheaper (most of the time)? Personally for me, I am at the point where I can afford to fly the more comfortable and reliable FSC but it doesn't mean I have an open cheque book. Hence, I have to find the best deal at that price point. Coming back, the years between 2000 and 2008, I was flying to the US a lot (6 times a year) and back then the American airlines gave me the best deals, with Northwest Airlines in particular. So I signed up for their Northwest Worldperks frequent flyer membership which was later converted to Delta Skymiles when the latter acquired Northwest Airlines. Now that I am in another job and no longer flying to the US, my Delta Skymiles membership card is now sitting in a corner collecting dust. I was just 1 US trip to hitting the 1 million mile mark. What's ahead for me then? Air China is my preferred airline of choice, for domestic China routes, followed by Shenzhen Airlines which both of them are Star Alliance members? Does it mean that I can go back to Krisflyer? The answer is no as I have discovered that Air China's Phoenixmiles membership gives me a better deal. The thing to all these frequent flyer membership is that you need to consolidate all your miles in a single card before you can actually reap the benefits. Too often do we have miles scattered everywhere only to be useless at each respective program. Let me give you an example. Say you have a total (all memberships) of 60,000 miles. That's more than enough to get you a return business class ticket back to Singapore from Hong Kong but only if they are all in a single membership account. So let's say that in reality these 60,000 miles is spread out evenly among your 3 memberships (Star Alliance, One World and Sky Team), then each account's 20,000 miles can't do squat. So, between Singapore Airlines' Krisflyer and Air China Phoenixmiles which are both Star Alliance members, why the latter? For starters, Air China Phoenixmiles is more widely recognised in China and they have separate private arrangements with other airlines not in the Star Alliance network e.g. Eva Air, Shandong Airlines, Cathay Pacific, Dragon Air, Air Macau, etc. 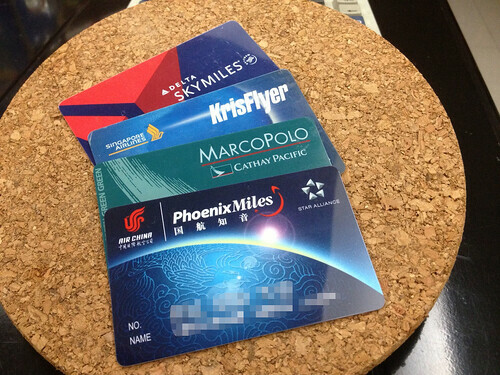 In other words, I can fly Cathay Pacific and still accumulate the miles in my Phoenixmiles card. The only downside is that these miles cannot be counted towards your FF Elite status qualification. Still, you can use these miles to change for free tickets or upgrades on Air China flights. Sorry Krisflyer, I am still not coming back to you. You will have to do better.